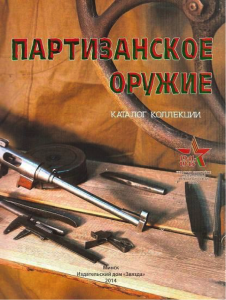 The book presents a unique collection of self-made weapons, which were made and used by Soviet partisans who fought in Belarus in 1941-1944. The museum exposition opened on 22 October 1944 in Minsk (Belarus). The catalog of the collection was published in the year of the 70th anniversary of Belarus liberation. The author and editors are G.V.Scorinko, the deputy of the Chief curator of The Belarusian Great Patriotic War Museum, and S.A.Loparev, the author of a series of articles about partisans’ weapons. The main content of the book is the collection of self-made submachine guns made by artisans of partisans’ troops. The collection includes copies of famous guns (PPD-40, PPSh-41, PPS-43) as well as completely original models. The total number is more than 50 items accompanied by technical characteristics and images. Besides self-made submachine guns the catalog presents other samples of firearms and cold weapons. The book has the name index, bibliography and list of materials of the Belarusian Great Patriotic War Museum. There are introductory articles in English and German to all parts of the book.